Katanyu Pongstaphone (Tan Pongstaporn) is a native of Thailand and a naturalized citizen of the United States. His primary education was in England, and his secondary education was in math and physics at Samford University, Birmingham, AL. 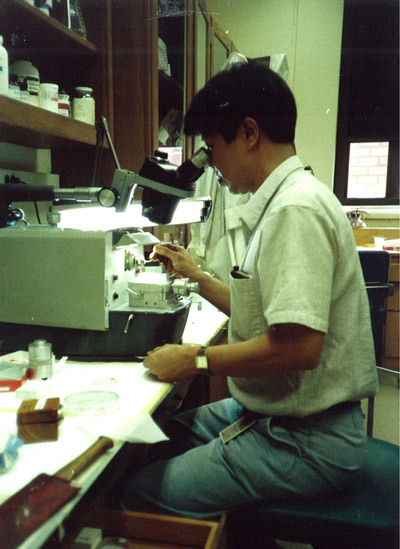 He has been a student of ultrastructure for many years, working in the Department of Pathology at the University of Maryland, Baltimore and in the Ryugo lab since 1988. His love of electron microscopy has led him to be a teacher of students and residents as they pass through the lab. When not working in the lab, he enjoys walking, politics, and importing jewelry. He is married and has two grown children, Ruth and Paul. He is known among colleagues as the "International Man of Mystery."